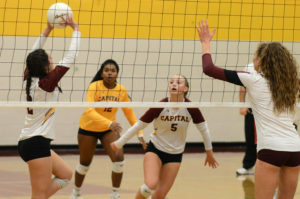 The Capital High School volleyball team will seek perfection as well as a second consecutive state championship when it travels to Yakima for the Class 3A state tournament. The first round of the state tournament will take place on Friday, November 16, at the Yakima SunDome. The Cougars (17-0) will face Seattle Prep (17-6) in the opening round at 11:45 a.m.
No team in the state has been as dominant as Capital has been this season. Coach Katie Turcotte’s squad will take a school record 31-match winning streak into the tournament as they attempt to become just the second 3A program over the last 20 years to successfully defend its title. Should the Cougars add four more tallies to their win total this year, they will join Seattle Prep (2001-2003) as the only teams to win consecutive 3A state crowns in the 2000s. A total of six schools, including Fife (1995-96), Selah (1993-94), R.A. Long (1983-85), Burlington-Edison (1981-82) and Mark Morris (1979-80) have accomplished the feat all time. Capital would also become the first undefeated state champion since Auburn Riverside posted a spotless 36-0 record in 2014 with the Ravens’ final win that year coming against the Cougars in the title match. Just how impressive has Capital been in 2018? 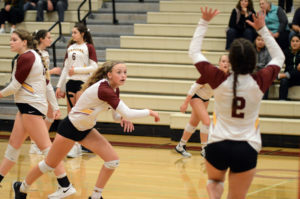 The Cougars ran roughshod through their competition, winning 60 out of a possible 62 sets en route to winning the 3A South Sound Conference and 3A West Central District championships. The Cougars dropped one set during the regular season. That came during a 3-1 win over conference runner-up North Thurston on September 13. Led by the senior quartet of Emma Boyd, Teagan Jones, Betsy Knutson-Keller and Ashlynn McFarland, junior sensation Maia Nichols and sophomore standouts Madison Nichols and Devyn Oestreich, Capital swept their next 13 opponents, including posting 3-0 victories over Lakes and Stadium in the opening two rounds of the district tournament. 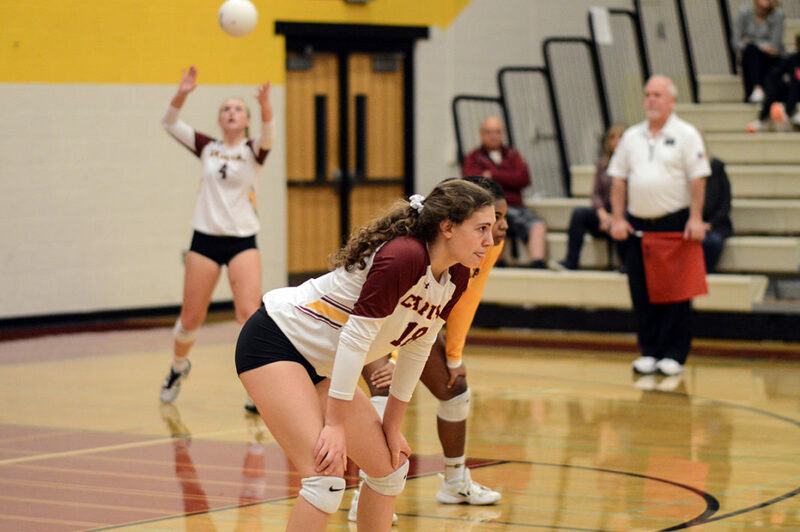 In the district championship match on November 10, the Cougars dropped the first set to 3A Greater Saint Helens League co-champion Prairie, losing by a slim 25-23 score, before rallying to win the final three sets (25-22, 25-20, 25-19). Capital is a stellar 38-1 over the last two seasons with the team’s only defeat over that span coming against Gig Harbor on October 4, 2017. 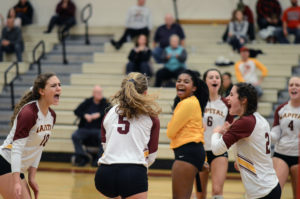 The Cougars won the program’s first state title after defeating Mercer Island (25-23, 14-25, 25-15, 25-14) in last year’s championship match with Maia Nichols receiving state tournament most valuable player honors. This marks the third straight state tournament berth and 19th overall for the Cougars, who have collected 10 state trophies all time. In addition to last season’s first-place finish, Capital also finished second at the 3A state tournament during Turcotte’s senior season of 1993 and in 2014. They also posted a second-place finish in the 2A state tournament in 2013. A victory in the first round over the Panthers would place the Cougars in the quarterfinals where they would face the winner of the first-round matchup between Bishop Blanchet (14-9) and Snohomish (16-1). Capital’s half bracket also features opening round contests between Stanwood (14-3) and Eastside Catholic (13-6) and Stadium (14-6) and Mount Spokane (14-1), which finished third at last year’s tournament. Looming on the opposite end of the bracket is Northwest Conference champion Ferndale, which joins the Cougars as the last remaining undefeated teams in the 3A classification. Much like Capital, the Golden Eagles have cruised through their competition this season, posting a perfect 18-0 record. Ferndale’s resume this year includes two wins over 1A state champion Lynden Christian and victories over 2A state runner-up Lynden and 2A state fifth-place finisher Burlington-Edison, as well as triumphs over 3A state participants Lakeside, Stanwood and Snohomish, with the latter coming via a 3-0 sweep in the 3A District I championship match. Ferndale, which is making its sixth straight state appearance and finished fifth at last year’s tournament, features perhaps the largest squad among the remaining 16 teams. The Golden Eagles, who will face Metro League champion Roosevelt (17-4) in the opening round, have nine players on their roster who are 5-foot-10 or taller with six players hitting the 6-foot mark. Additional first round matches in the 3A state tournament include Southridge (10-7) facing Wilson (16-2), Oak Harbor (13-4) playing Prairie (14-3) and Mountain View (15-4) squaring off against 2016 state champion Lakeside (16-6). 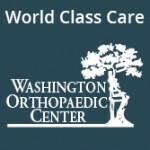 Semifinal matches will be held at 1:00 p.m. on November 17 with the championship match at 7:00 p.m. Previous articleYou’re Putting What in My Backyard?